Nico Rosberg and Mercedes took the top-end sting out of the 2017 driver market when they announced a two-year extension to their contract on Friday morning in Hungary. Rosberg, twice championship runner-up and a Mercedes driver from the season the German marque returned to Formula One, was out of contract next season, but on Friday he confirmed a new two-year deal had been agreed. “A special moment for me, of course,” Rosberg said. “I look forward to the future. While Rosberg was never a real risk of leaving the sport’s dominant team, tensions between him and his three-time world champion teammate Lewis Hamilton over the past two seasons threatened to make the partnership unworkable. 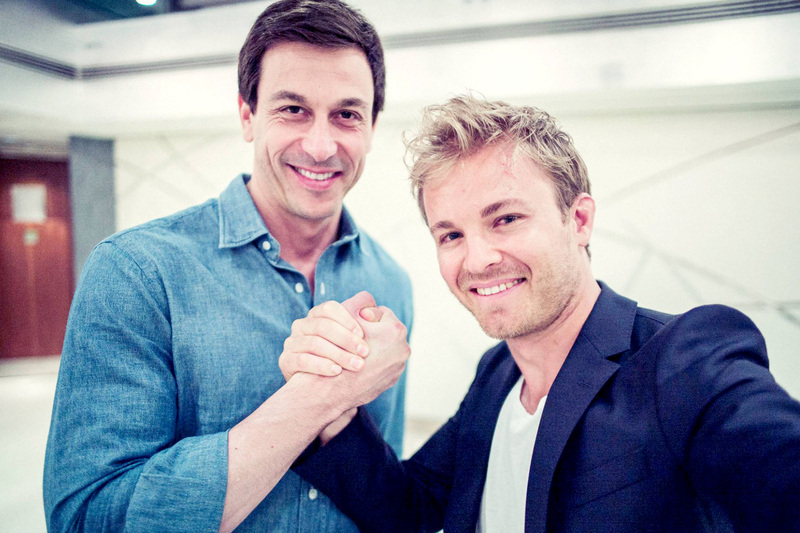 Mercedes executive director Toto Wolff at the end of last season raised the prospect of breaking up the duo if they couldn’t work for the greater good of the team, and crashes at this year’s Spanish and Austrian grands prix raised the spectre of his ultimatum. Delays in the final agreement intensified the rumours that negotiations might encounter such a hurdle, but Rosberg, current championship leader after dominating the early part of the year, insisted the protracted talks were only about securing the best possible deal. “I had a very good feeling for a long, long time, but it takes a while because there are so many details that need to be discussed and clarified,” he said. “Gerhard Berger took charge of it for me, and that was the best decision for sure, and I’m very thankful that he accepted to help out with it, because he knows what he’s doing. “I’m very happy with the end result and ecstatic to be going to the future now with a few more years together at least. “It’s an exciting feeling and a special moment to put a signature on such an important thing in my life, job-wise. Wolff added that he was similarly assured the a deal would be concluded to keep the 19-time race winner at his team. “We are very happy, obviously,” said the executive director. “We had a couple of weeks of discussions. It was always clear we wanted to continue. The two-year deal quashes rumours raised by Red Bull Racing principal Christian Horner that Sebastian Vettel, were Ferrari to fail to make a championship bid in the near future, would move to Mercedes in 2018. The contract situation at the Silver Arrows leaves it vulnerable to a complete driver overhaul in 2019, however, with contracts with both Rosberg and Hamilton due to expire at the end of 2018. Mercedes has Manor driver Pascal Wehrlein and Renault third driver Esteban Ocon on its books as potential replacements for its senior drivers. Wehrlein has thus far had a solid debut season with his backmarker team, while Ocon appears likely to earn his F1 chance next season at Renault. ← Max? I’m only scared of sharks and snakes!